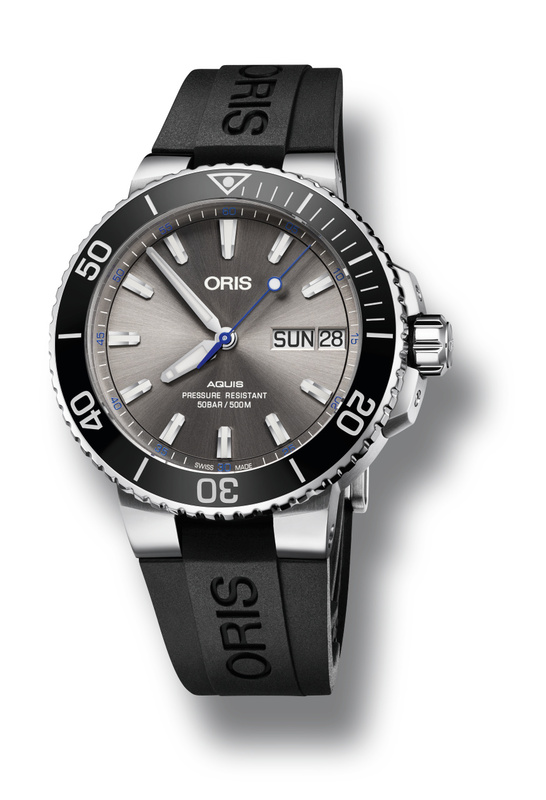 Swiss independent brand, Oris, which has achieved a very successful graphic with the Diver's SixtyFive model in the past two years, introduced the Oris Hammerhead Limited Edition model from the Aquis collection, which has been updated in the past few days. 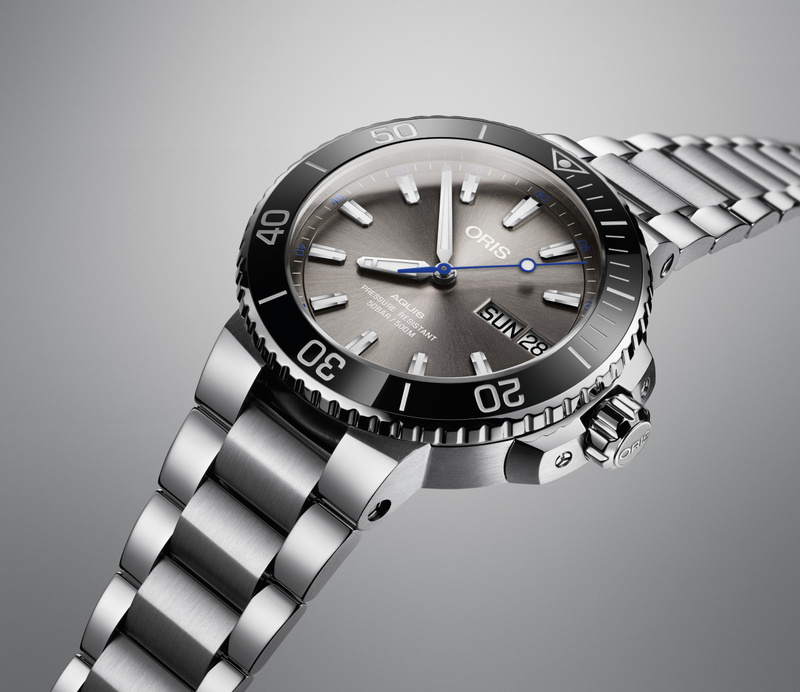 Oris, which has been quiet successful with the Diver’s SixtyFive model and its variations followed, introduced the Hammerhead Limited Edition under the renewed Aquis collection. The new model features the recently updated case and dial design from the 2nd generation Aquis with limited edition of 2000 units only. Known for its projects to protect marine life and its support for international oceanographic institutes, the brand has dedicated the latest limited production model to the Hammerhead Sharks, which is under threat of extinction. The funds raised by the sale of the new model will be donated to the Pelagios Kakunjá non-profit organization led by the professional diver and brand ambassador Jérôme Delafosse. 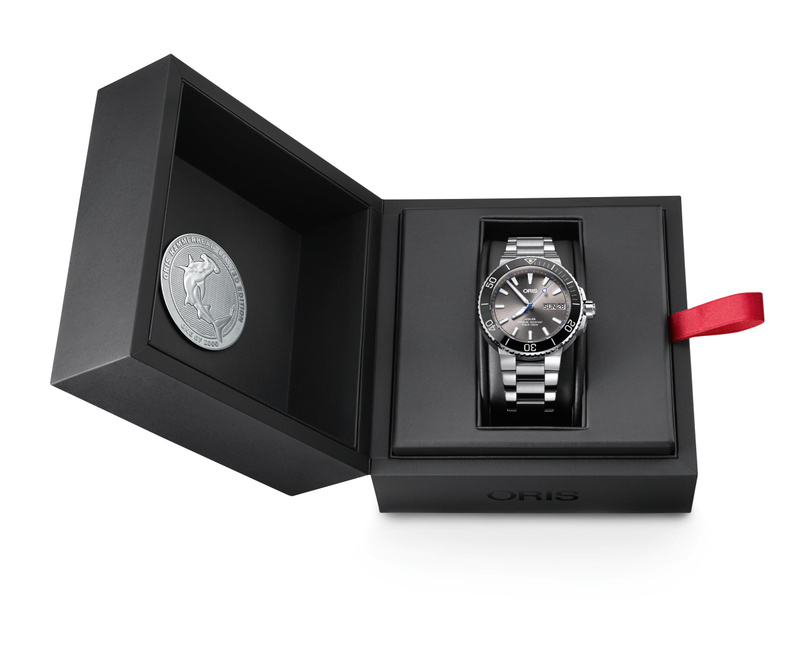 The model, which is developed on the new 2nd Generation Aquis platform introduced recently, is offered in a stainless steel case measuring 45.5mm in diameter. The case sports a scratch resistant sapphire crystal on the front side while the rear side is covered with a solid stainless steel caseback engraved with a logo of the organization and limited edition information. 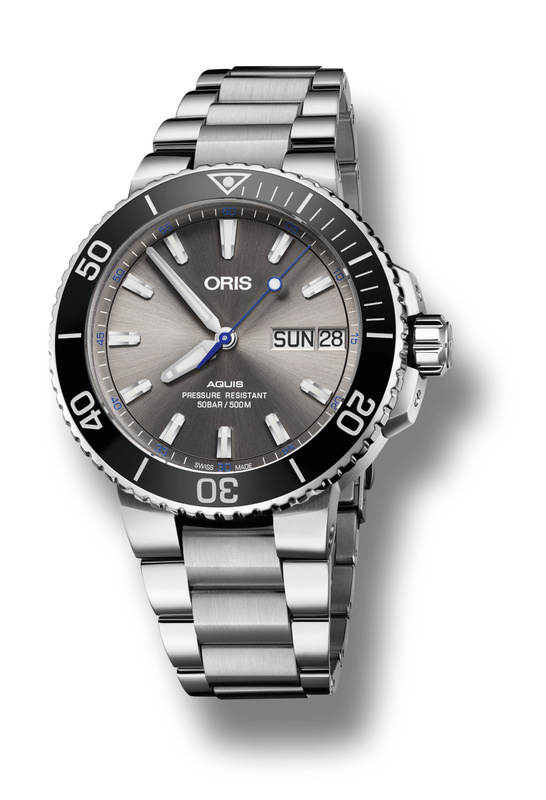 The screw-in winding crown is Oris signed and rests between a pair of thick crown guards with small screws. The timepiece is water resistant up to 500 meters. The dial of the new model is finished in light gray which is inspired by the Hammer Sharks. Thanks to the Sun Ray surface, the dial has a very lively look under certain angles. The dial is accompanied with the brand’s signature design indices and hands which are filled with Super Luminova phosphorus material for an improved legibility at dark. The day/date style display is located at the 3 o’clock position with contrasting white font over black background day/date disks. The new model is powered with the Oris Caliber Ref. 752 which is based on the Sellita SW220-1 movement which we are familiar with from the entry to mid level Swiss automatics. 26 jeweled movement beats at 4Hz and offers 38 hours of power reserve when fully wound. 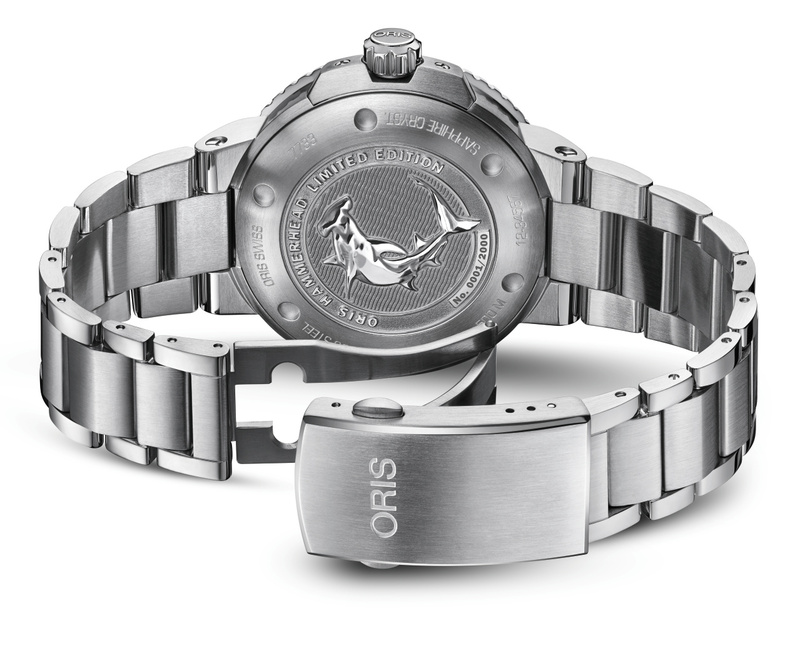 The Oris Hammerhead Limited Edition is available with a choice of stainless steel bracelet or black rubber strap. Both versions are presented in an exclusive box. The models will be available by July 2017 with MSRPs as 2550, 00 CHF for the bracelet version and 2350, 00 CHF for the rubber strap version.